I have a tendency to hold on to things. A letter (ok, 20) from high school, jeans that MIGHT fit again (cough, cough), and wine. In some circumstances it can be a good thing. After all, the fashion from middle school is coming back around. In others, well, what can I say…I’m sentimental. When it comes to wine, some deserve to be held. Some deserve to be enjoyed before the weather changes. Others are just waiting for the right meal. 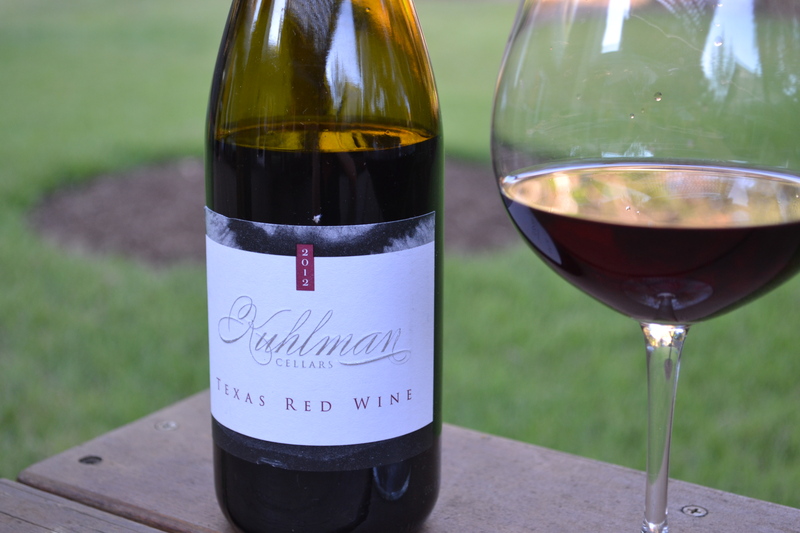 Last spring we went to Kuhlman Cellars and I’ve held one Sauvignon Blanc and one 2012 Texas Red Wine. Because their wines are fairly new on the scene, one can only guess what will happen in time. Why take the chance? It was Saturday and it was time to clean out. My closets and my body are in need of the bi-annual purge so before it begins, one last indulgence. 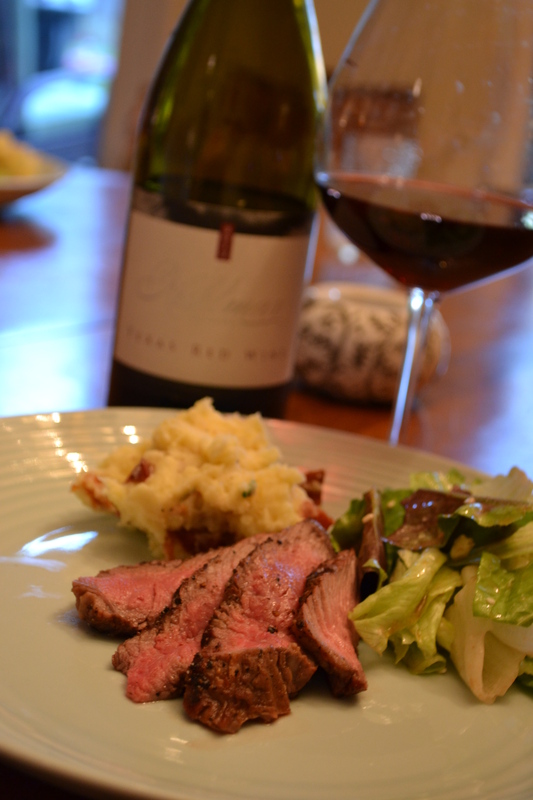 The 2012 Texas Red Wine is a blend of Merlot, Cab Sauvignon, Carignan, Cab. Franc, and Grenache. In the glass, a dusty brick-red with a hint of plum. On the nose, black cherry and plum, cinnamon or clove. Notes of bright red cherry at the forefront, this wine was balanced and consistent, front to back, beginning to end. Warm, friendly, with a bit of sass. Savory notes begged for a steak. I obliged. We grilled some grass-fed strips. I had leftover bacon from the morning so I tried a new play on potatoes. I’ll call them Baked Potato Mashers.Even my daughter who is naturally averse to carbs (whose kid is she?) loved them. Add a salad with blue cheese vinaigrette and we had a meal that made all of us smile. If you aren’t familiar, Carignan is a grape that you see a lot in blending and one that I am quite fond of. I think it often provides the “sass.” Jeremy Wilson of Kuhlman Cellars wrote an informative piece on the history of and future for this grape and Kuhlman. I, for one, am super excited to see more of this beauty in Texas wine. Thanks! It turned out well.